Recycle your trash into decorative accessories for your home. Drill and light wine bottles to create an elegant lamp for your counter, entryway or a small vignette. Save your wine bottles throughout the year and ask your friends to save them for you. Sell the lamps at craft shows or transform empty bottles from special occasions into anniversary or wedding gifts for family and friends. This inexpensive project uses Christmas lights that can be purchased on clearance after the holidays. Lay your wine bottle on a flat work surface. Position the bottle with the back facing up. Place a long strip of masking tape across the neck of your bottle and tape it to the work surface. Place another long strip across the bottom half of the bottle and tape it to the work surface. This will prevent the bottle from turning or rolling away while drilling. Do not tape over the paper labels. 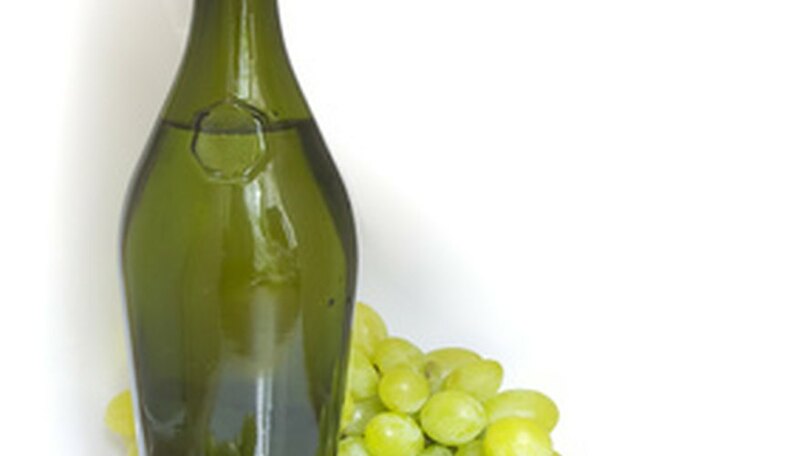 Place a ruler along the center backside of the wine bottle with the end even with the bottom edge. Measure up 1 inch and mark with a piece of masking tape. This is your mark for drilling. Insert a 1/2-inch diamond-tip drill bit into your drill. Place the bit on the masking tape mark. Slowly drill into the wine bottle, stopping every 10 seconds to spritz the area with a water bottle. The water will cool the glass, preventing breakage. Continue until you have drilled through the glass. Plug a 1/2-inch rubber grommet into the hole. The grommet will prevent the sharp edges of the glass from cutting into your electric light cord. Unwind a new string of 35 clear Christmas lights. One end of the string will have a plug and several inches of cord with no lights. The other end starts with a light at the tip. The remaining lights are evenly spaced a few inches apart, the length of the cord. Insert the light at the tip of the cord through the rubber grommet. Continue to insert each of the remaining lights into the bottle. The lights will tangle naturally inside the bottle. The plug and bare cord are left hanging out of the drilled hole.